We had another rainy and cloudy day, but that didn't stop me from heading outside to photograph this post. I wanted to celebrate Tartan Day(April 6), because I love Scotland. 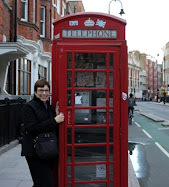 I'm not Scottish, but I traveled to Scotland in 2011 and enjoyed my visit so very much. I would love to return someday. While in Edinburgh I bought a scarf and tam in the "Wallace Clan" tartan pattern. Nothing is better than pure butter Shortbread cookies. I was going to bake some old fashion shortbread cookies, but I couldn't resist buying these darling 'Scottie Dogs' when I saw them in Safeway last week. Very Cute. Don't you think? The Daffodils are just wonderful. I picked a few for this vase from places that are hidden from the camera's eye. If nothing else in the world that gives me joy, I certainly receive generous doses of joy from my garden. This is my Tartan scarf and Tartan Tam. I wear them to church on The “Kirking o' the Tartans” in November and especially during the festive Christmas season. Our car blanket became my tablecloth today. We carry two blankets in our car all times. One for each granddaughter or sometimes I cuddle up in the cozy blanket on long road trips. Have you ever tried to find a tea cup and saucer with a thistle pattern? I found this sweet thing at the thrift store. a very long time ago when Scotland was ravaged by Viking invaders, a group of Scottish fighting men were resting overnight in a field. Unknown to them, a viking raiding party was preparing to attack this group of Scots, under cover of darkness. As the attacking Vikings approached the encamped Scots, they stepped into a patch of thistles with their barefeet, and of course cried out in pain, as the thorny thistle spikes imbedded themselves in their feet and legs. The thistle is akin to a weed that inflicts such spines and pain, the 'nettle'. The weed that keeps giving pain for hours after pricking the skin. The Scots, having been awakened by these cries, were alerted to the invaders and able to fight off the attackers. So, from that day, the Thistle has been adopted as Scotland's National Emblem. Everywhere you go in Scotland, you will see the emblem or picture of the Thistle. A dangerous little weedy flower, and it can be quite painful and destructive .......just like a Scot! Scottish folks love their Scottie Dogs too. While touring England and Scotland in June 2011, I wore my Tartan almost everyday. Hope you have a wonderful week and Happy Tartan Day! Betty, I absolutely love this. I do have Scottish ancestors in Clan Cameron and I love Scotland! How sweet of you to honor the tartans and tell the wonderful story of the thistle. Thank you for sharing your Scottish treasures!! Lovely post, Betty! Your Scottish scarf and tam are beautiful. I love the pattern! The Scotty shortbread cookies, look cute. I will have to look for them the next time I am in the store.. Your Thistle tea cup is pretty. Thanks for sharing the story and your post. Have a happy week ahead! How wonderful to have a pretty day to set up everything outside. It's also fun to see you in the tartan. We just got back from a hike and saw some huge thistle plants in the field near where we parked. They were 3 ft tall! I took pics! heehee! Enjoy your day! 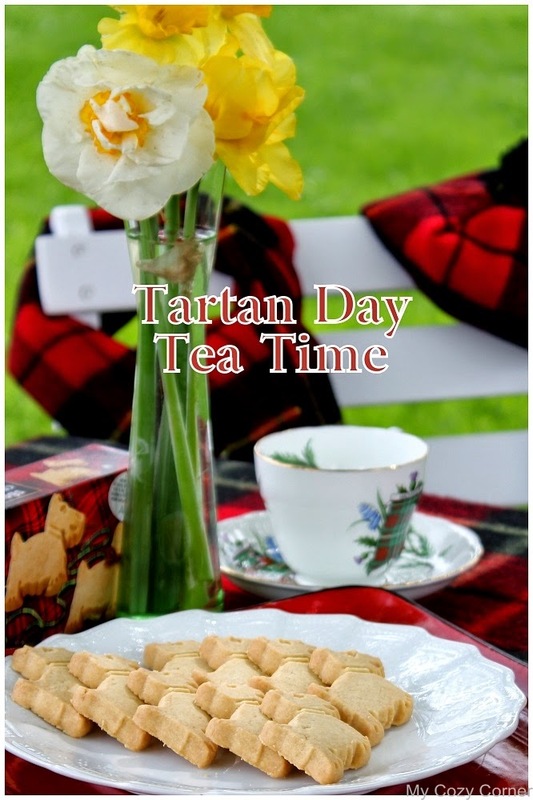 The red tartan really pops and I love the Macgregor pattern tea cup and saucer....beautiful! I loved reading your history of the Thistle emblem Betty! I always buy the Walker shortbread to enjoy with a cuppa too - my husband and I are trying to cut out sweet things now as wee need to lose a little weight that's crept on! I didn't know today was Tartan Day. You've set up a beautiful tea time. Walker's shortbread is so delicious, thank you for serving them! Have a wonderful week, Betty. The scottie shortbreads are so cute, I'm going to look to see if we have them here. I have a teacup with a thistle, no tartan though. You look very nice in your tam and scarf. You look nice and warm in that tartan! My what a lovely garden you already have! Perfect! I love your teacup! And the tartan blanket/tablecloth is such a bright cheery backdrop. And the cute Scottie dog biscuits are darling! Thanks so mucg for sharing and linking to Tuesday Cuppa Tea! I had never heard of Tartan Day but should celebrate. I have a bit of Scottish in my ancestry. Will have to look up our tartan. I do have a couple of thistle tea cups. Was lucky to find them. What a wonderful post, Betty. I love tartan and the Wallace tartan is really pretty. I have a wee bit of Scot in me on my Daddy's side. He always adored tartan. 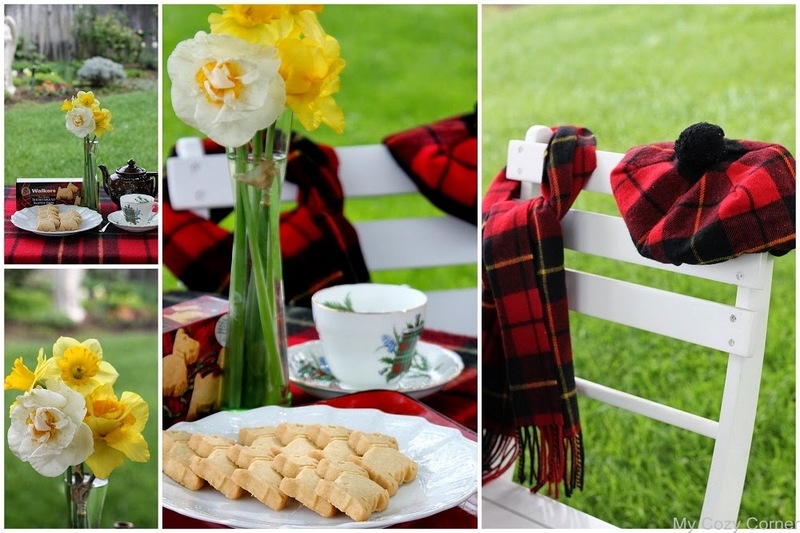 The blanket makes a wonderful table covering and your Scottie dog shortbread is adorable. I love Walkers shortbread and had some with my tea today but I have never seen the dogs. My mother always loved her scottie dogs and remind me of her whenever I see them. I would love to find a box of the cookies and take them in to her. She is in a Home now and she would get such a kick out of the Scottie cookies. Your thistle teacup is lovely and the teapot is cute too. 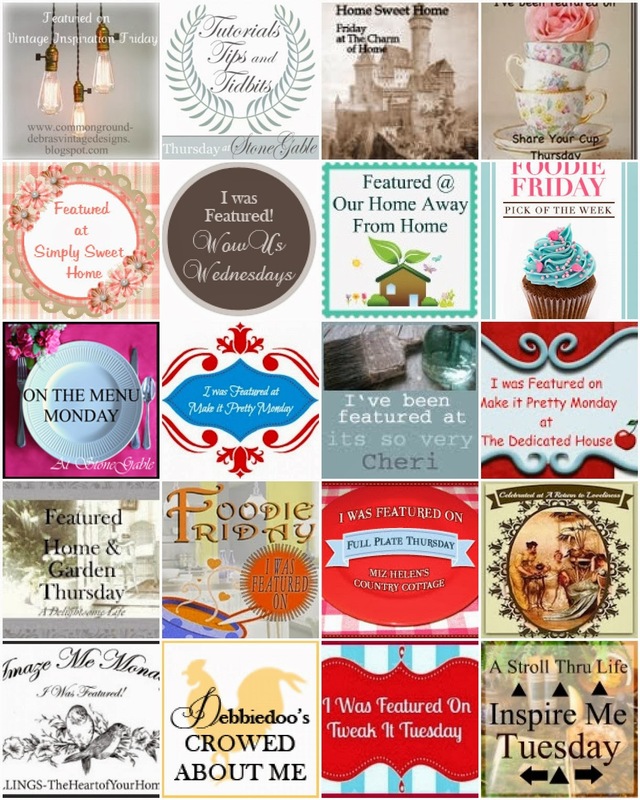 Thank you for sharing your delightful post at Tea Time and have a beautiful day. I love your tartan post! The colors are so vibrant and fun. The scottie dog cookies are perfect for your theme, I would have bought them too. Thistles are one of my favorite flowers...not the thorns though. lol! Great story about them. And, your tea cup is perfect! Thank you for sharing your Scottish tea with us today. Oh how darling! My mom's maiden name is Ferguson so I picked up a few scarves for her with her family tartan, and she loves them. I will have to see if I can find her a tea cup like you have with her name on it. Those scottie dog cookies had me so happy just seeing them (never saw that shape before!). 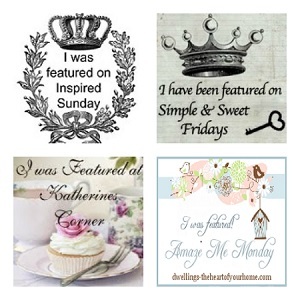 Glad you shared pictures of yourself in your finery!! Fun post! I think Tartan Day is a grand idea. The scotty shortbreads are too cute to eat! Great teapot and love the thistle teacup. Happy Tea Day! Lovely tartan tea. Thanks for sharing. Nice theme! Very pretty pictures. Thanks for sharing.